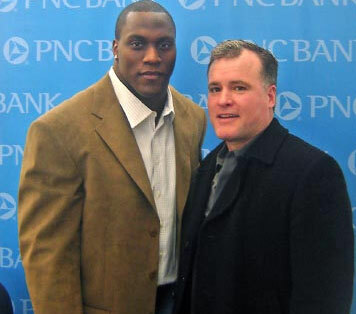 A two-time Pro Bowl selection and one of the top playmaking linebackers in recent NFL history, Takeo Spikes (pronounced tuh-KEE-oh) joined the Eagles on March 26, 2007, in a three-player trade with the Buffalo Bills. Takeo, which means "great warrior" in Japanese, was a first round draft choice of Cincinnati in 1998 and spent his first five NFL campaigns with the Bengals before signing with the Bills in 2003. Give us a call for your next event Takeo will make your event the talk of the town!